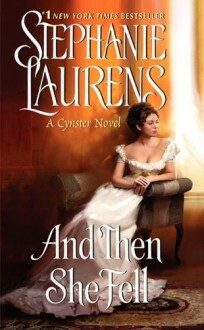 New York Times bestselling author Stephanie Laurens returns to another utterly irresistible branch on her beloved Cynster family tree in And Then She Fell.Set in Regency England, London’s Henrietta Cynster, known as “The Matchbreaker” has a special talent for making sure that bad marriages never happen. After breaking up one ill-suited couple, Henrietta is obligated to find the perfect bride for the debonair James Glossup. The assignment proves to be a challenging one for the single-minded Henrietta, who believes that finding love isn’t in her own stars. But Henrietta discovers—in spite of her personal denials of love—that both she and James are indisputably drawn to each other.Fans of Stephanie Laurens’s Cynster books and readers of smart and compelling historical romances will be transported and entertained by And Then She Fell. She helps women escape mis-matches, enough that she's been called "The Matchbreaker" but now she's helping James Glossup find a partner in order to inherit, and to add to the mess, someone apparently wants Henrietta dead. Entertaining and fun with a smidge of goddess-worship.